As luck would have it, I ended up visiting Japan at the same time that the new Butai Sengoku Basara 4 stage play was running in Tokyo. This is the first time in the five years of the stage play series that I have managed to accidentally time one of my trips to coincide with the plays and I wasn't about to miss this chance, so yesterday evening I found myself excitedly approaching the Tokyo Dome City Hall along with a couple of thousand of other eager fans to see how well the Sengoku Basara 4 storyline made the transition to live action. I'd had no idea that I would be able to see this stage play until a few weeks ago so I didn't purchase my tickets as early as usual. It was incredible, then, that I managed to get a really good seat right at the front of the first floor of the balcony despite the show being almost sold out. I could see absolutely everything, right down to the actors' finely chiselled physiques. Those of us who weren't seated in the arena below missed out on the fun of having the actors running into the aisles during the performance (Yukimura even apologised to several audience members as part of the act! ), but with a perfect view of all of the action there was no reason to be disappointed. I am forever grateful that Lawson's online ticketing system accepts foreign credit cards, making reserving last minute tickets much less stressful than it might have been otherwise. I'll summarise the overall details first. The play's run began in Tokyo on 31st October 2014 and it will end in Nagoya on 7th December 2014 after 27 performances. There's also the usual extended cast of nameless background soldiers and the whole thing has been put together by maestro Nishida Daisuke and the original creators at Capcom. Fans may notice that there are fewer named characters than last time; presumably Nishida chose to keep things simple so that they could introduce the new setting without too much mayhem. The result is a very tight story which leads up to a struggle between four factions (yes, just four!) before a satisfying climax. From here on, I'll be talking about the content of the play so please stop reading if you don't want any spoilers. There will be rambling, too. Without being able to refer back to a DVD to help jog my memory, it's difficult to remember everything in order. I don't want to spoil the entire plot anyway, so I think I'll just very simply summarise the play and then go through each character in more detail to make it easier to avoid unwanted spoilers. The stage was arranged with four quarters of a roulette table spread across it. These moveable panels slid horizontally from side to side at strategic moments - no doubt inducing feelings of panic in anyone who has played Sengoku Basara 4 - and this feature was used very cleverly to break up scenes and allow characters to vanish and reappear without having them run off the side of the stage all the time. It also made it easier to pull off tricks like Yoshiteru's weapon transformations; his shaku could switch between sword, bow and spear forms during fight sequences without any awkward moments. The story will be instantly familiar to anyone who has played Sengoku Basara 4, even down to the introduction with Yoshiteru relinquishing his right to rule in the speech which opens the game. At the beginning, there were six armies in play: the Ashikaga faction (Yoshiteru, Kotarou, Nagamasa, Oichi), the Oda army (Nobunaga, Mitsuhide, Katsuie), the Date (Masamune, Kojuurou), the Takeda (Yukimura, Sasuke) and the Toyotomi (Mitsunaru, Yoshitsugu, Sakon). Ieyasu had recently left the Toyotomi and struck out on his own. Over the course of the story, characters forged and broke bonds with one another until the strongest army remaining had to face Yoshiteru himself. Characters who don't appear are frequently mentioned in the dialogue as a tease, including Ranmaru and Nouhime. I was originally worried that there wouldn't be much comic relief without the sillier characters, but there was plenty: most of this came from Yukimura's insatiable enthusiasm and Nagamasa's tunnel vision, but even Mitsuhide provided a few dark laughs with his brutal fighting style and over-the-top personality. Amano Kousei's Ashikaga Yoshiteru is exactly like his game counterpart, an inscrutable born leader with an intimidating aura. His voice sounds nothing like Ikeda Shuuichi's, but that's the only meaningful difference. He proves his overwhelming power right in the introductory sequence by swatting Ieyasu away like a fly, and for most of the play he exists on the sidelines, occasionally commenting on the new developments he sees unfolding before him. Yoshiteru's soliloquies are occasionally interrupted by an unexpected guest: Matsunaga Hisahide (I believe he's still played by Matsuda Kenji). Even though he's not credited as one of the cast members, Hisahide appears projected onto screens at the back of the stage in a couple of sequences to needle the shogun with his words (and occasionally, to blow things up). He also speaks from off-stage at one point. I had been wondering how they were going to work Fuuma Kotarou into the plot without either of his masters there to speak for him so I guess this was the solution! Speaking of Kotarou, he's wonderful. Takahashi has the perfect athletic physique to be able to bring the legendary ninja to life and watching him performing his acrobatic flips and rolls live was a treat. His role in the story isn't huge - he's mainly used to despatch the hordes of soldiers which come for Yoshiteru every now and then. Without Tsuruhime or Ujimasa around to lighten things up, Kotarou doesn't provide any jokes at all this time. Kubodera is back as Nobunaga once again and he seems to get more ferocious in every incarnation. His costume is so close to the real thing that it sometimes feels as though Nobunaga has popped out of the game's CG artwork. He moves his large sword at speed without seeming to expend any effort, and casually blasts his gun without bothering to steady himself - there's not a single trace of weakness in this version of the Demon King. At Nobunaga's side is Akechi Mitsuhide, played by another familiar face. Taniguchi has actually been Tenkai in most of the stage plays by this point, so it's strange to see him back in his old guise full time; the costume has improved enormously since the early days of Butai Sengoku Basara! Without having to pretend to be Tenkai, Taniguchi is able to go all out and make Mitsuhide as creepy as possible this time around. The choreographers have enhanced his unpleasant side with some great new moves; Mitsuhide's fighting style translates beautifully to live action. It's probably a good thing that Gotou Matabee wasn't included in the cast list this time around as the two of them tearing through soldiers together would have been a horrifying experience. Even though Tenkai never shows up this time around, he hasn't been forgotten; there are still references to the secret double life which Mitsuhide leads in Sengoku Basara 4 and his connection with Kingo. Rounding off the Oda army is Shibata Katsuie, and of the newcomers I think he's made the transition to live action most successfully so far. His shiny armour looks very nice, and his fighting style is quick and exciting to watch without relying on special effects. Fujita Ray does a great job with a difficult role, portraying the over-ambitious Katsuie from the past (via a flashback), the hopeless Katsuie from the present and the cool, dependable guy he can be when he isn't being trampled under someone's foot. His complicated relationship with the Azai couple is handled early on in the script and he eventually goes through both chunks of character development from the game, meeting with Masamune and then Sakon. Katsuie's story benefits greatly from being told in a clear, linear fashion rather than through sporadic cutscenes. I know that a lot of people find it difficult to like Katsuie, but I'm a fan of what he brings to the series and I thought he was brilliant in this play. It's worth noting that Fujita Ray has had some involvement with Sengoku Basara before as his band Dustz performed the first ending theme to Production I.G. 's anime adaptation. Opposite Katsuie is the last of the new characters for this play, Katou Keisuke's Shima Sakon. Sakon's fighting style was always going to be tough and it loses a little of its infeasible speed in the stage play. He also spends quite a lot of time being beaten up and lying on the ground, both in the flashback to his meeting with Mitsunari and in the present. However, what he lacks in flair he makes up for in dialogue. Sakon's relationships with the other warriors in the Toyotomi forces not only provide plenty of laughs, they help develop Mitsunari, Ieyasu and Gyoubu in ways which wouldn't be possible otherwise. He's indirectly responsible for several of the biggest plot advances in the story. I'll be interested to see where they take Sakon (and indeed, the rest of the Toyotomi army) in future instalments of the stage plays. Wherever Sakon goes, Nitta's Yoshitsugu is probably close behind. Gyoubu has a more active role than usual this time around - obviously he's still frail and unable to walk, but he has a very nice fighting scene protecting Sakon and some of the best lines in the script. He manipulates a sword at one point rather than relying on the special effects for his prayer beads and I was pleased that they treated him well. There was always a danger of Gyoubu fading into the background since Sakon is so popular and loud, but that never happens here. The last of the core Toyotomi army members is Mitsunari this time (Hideyoshi and Hanbee are frequently mentioned without ever showing up). This is the last play where Mitsunari will be played by Nakamura Seijirou and it's a real loss to the series that he's moving on. His voice sounded hauntingly close to Seki's when he delivers his emotionally charged lines about friendship and betrayal to Ieyasu at the end of the first half. I don't know how Nakamura has learnt to mimic Seki's unusual tones so well to create a perfect live action version of Mitsunari - if he ever gives up his stage career he'd make an excellent seiyuu. His swordplay is also much more impressive live on stage. The blade twirls so quickly that it's impossible to follow its path as it dances around. It's Mitsunari's relationship with Ieyasu which incorporates the most brand new content this time, with the story going above and beyond the developments in the original game to offer a surprising twist. Hirose Yuusuke brings all of his energy into Ieyasu's physical fighting style, leaping and throwing punches without flagging for a moment. He also brings out Tadakatsu's spear for one attack and briefly fights with a borrowed sword near the start of the show; Ieyasu fans get to see many different sides of him. I can't imagine a single one of them being disappointed by the growth he goes through during the story. This is Yamaguchi Daichi's first outing as Masamune so there was a lot of pressure; nobody has ever come close to matching Kubota Yuuki's charismatic performance in the role. 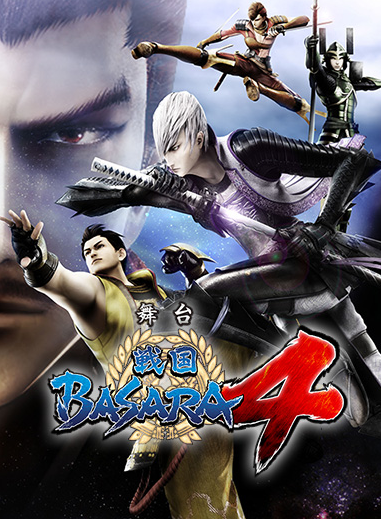 The script focuses on the new Sengoku Basara 4 characters first and foremost, so Yamaguchi doesn't have the added burden of playing the main character in his first play - but Masamune still symbolises the series for many fans. It's critical that he's played by someone who can capture his unique personality or it weakens the whole show. Yamaguchi's Masamune is unique, and very promising. His voice is much softer than that of Kubota (or Nakai) but he does his best to growl out Masamune's ridiculous dialogue, and he certainly looks the part. This new Masamune seems youthful and he's more agile than usual, spinning in the air during his combos. The climactic WAR DANCE moment was one of my favourite parts of the show, though the sequence where he's dressed in his special Sengoku Basara 4 hakama outfit was a highlight too - I noticed all of the girls around me raising their opera glasses to get a closer look at Yamaguchi's impressive muscles! Opposite Yamaguchi is another newcomer. Matsumura Ryuunosuke actually played Yukimura in the previous play too, but he was sharing the role with Yoshioka Yuu back then and I have yet to see how well he did thanks to the delay to the DVD version. Matsumura's take on Yukimura is different to the actors who came before him; he's got a gentle, pure side to him even when he's running around bellowing. Like the others, his role is expanded from the game; he's motivated by finding his own interpretation of 'fuurinkazan' at the start, but he ends up joining up with his precious rival before long and helps provide redemption to Katsuie. It was cute seeing Yukimura taking care of the younger man after having seen him running around like an overenthusiastic maniac at the beginning of the play. Most of the play's hilarious moments of comic relief come from the dynamic between Yukimura and Sasuke. Murata's deadpan reactions to Yukimura's craziness never cease to be entertaining, and their comedy routine after the intermission - complete with a parody of AKB48's Heavy Rotation - will stay with me for a while. It's hard to tell where Sasuke ends and Murata begins at this point. Yoshida Tomokazu is in a similar position after all this time in his portrayal of Kojuurou. He is Kojuurou; I've completely accepted him as an extension of the way the character appears in the games. Yoshida seemed more energetic than usual in the performance I watched, especially when it came to his swordplay. It was difficult to take my eyes off him. Sakurada Kousei's version of Nagamasa is probably one of the most successful game to live action conversions I've seen to date. Right from the intro where he sails onto the stage with a flying kick, everything Nagamasa does is over the top and full of hot-blooded sentai-style passion. Fans of the Azai couple will be thrilled to see him defending Oichi against Katsuie and her brother - it plays out a little differently to the routes in the game, thankfully. Last but not least is the only girl in the show, Tamaki Nami's Oichi. Tamaki's performance captures everything which makes Oichi such an intersting character; she's captivatingly beautiful, delicate and yet, at the same time, a formidable fighter. She mostly wields her naginata (the hands are a challenge in the medium of live action!) but there are a few darker moments where her demonic side creeps out, and these have more gravity for being rare. My favourite part was when Oichi would walk around swaying gently in the unnatural way she moves on the march screen in the game. Actually, scratch that - my favourite part was whenever Nagamasa grabbed her hand and ran around the battlefield with his wife in tow. They have amazing chemistry together. It's difficult to imagine that anyone has read all of my exciting sleep-deprived rambling up to this point, but if you have I suppose I should sum things up by saying I loved the show! It was great fun and bringing the stage play up to date with the games has my feeling very positive about where the series will go from here. The reason I chose the evening performance on 3rd November 2014 was that it came with an extra bonus in the form of a brief on-stage talk show with four of the actors: Nakamura Seijirou (Ishida Mitsunari), Hirose Yuusuke (Tokugawa Ieyasu), Yoshida Tomokazu (Katakura Kojuurou) and Murata Youjirou (Sarutobi Sasuke). All four of them are scheduled to graduate from the series when Butai Sengoku Basara 4 ends, making this my very last chance to cheer for them at a live event. The talk show was a mixture of tales from backstage and heartfelt messages of gratitude for the fans. They kept picking on Nakamura and the laughs didn't stop for a moment. It's no exaggeration to say that these four actors are a large part of the reason that I watch Butai Sengoku Basara in the first place, especially now Kubota Yuuki and Hosogai Kei have moved on. It's going to be weird seeing the series continuing without any of its familiar leads. In summary, getting the opportunity to watch the stage play live was a magnificent experience and well worth all of the time and money spent arranging the ticket. Everything is louder, faster and more exciting than it looks in the DVD recordings, and you can really feel how talented each actor is to pull off what is a very demanding show. If only this was more than a once-in-a-lifetime chance! I'm looking forward to future stories in the Butai Sengoku Basara 4 series now that the main characters have been introduced. The way this play was written, there's plenty of room to expand the story further and gradually incorporate the other newcomers along with other returning characters which complement them to avoid overloading the individual stories. I hope that both the stage plays and the original games will continue to develop the characters for many years to come. This sounds good especially the Azai part :3 I want to see it too now! I really want to see real Sakon even if he is a bit uncool in this. Did he stand on someone’s head? Also curious how Ashikaga’s battle style was shown. So they only introduced 3 SB4 characters. Hmm wonder if they possibly could portray Oyassan in a stage play? Yoshiteru's fighting style kept changing so it's difficult to describe; the spear wasn't used all that much but he switched between his weapons frequently. The coolest part was when he would calmly fire his bow and all of the screens would show the arrows raining down across the stage (with the actors reacting appropriately). It was beautiful, and very overpowered-looking. I also liked that they managed to show him clapping appreciatively at one point, just as he does in the game. Oyassan could probably be shown the way you describe Matsunaga was shown in this. Like yelling weird deer noises off-stage to Shikanosuke. I might feel forced to buy this one too when it comes out on dvd out of curiosity (it's cool to see the real version of everyone) and also because it was so nice to hear that the Azai couple was portrayed so well in it.